Maybe your New Year tradition involves a fun party, toasting, fireworks, kissing someone you love at the stroke of midnight or all of the above. Or maybe your new year “party” sounds more like the crackle of a fireplace and looks more like a favorite movie or a good book on your comfy sofa with a fluffy blanket and a warm drink. Regardless of how you choose to ring in the new year, consider adding these 10 songs to your playlist to help you celebrate the coming of 2017. I think you’ll find them a great addition to your year. Who’s up for some bling to bring in the new? Of course, that’s not what this song refers to but it does convey an element of sparkle that only comes from the refining process of Christ’s work in our lives. There’s a certain feeling that overcomes me when I see the date 1/1. All things new are coming. January 1st brings with it hope. No matter what is in the past, the moving hands on the clock prove that There’s Never Been a Moment like this. It is new and exciting and bathed in the lavish love of Christ. No matter what the previous year has been like, MercyMe reminds us that God is greater. Greater than who we’ve been. Greater than what we’ve done. The year ahead holds the promise of the goodness and greatness of Christ. No matter what this world brings in 2017, He is Greater. Can rioting be good? Can rioting be of value and worth? We’ve experienced a good bit of rioting in 2016. Whether we’ve experienced it personally or from the comfort of our safe sitting room, we can all agree that this has not been one of 2016’s finer gifts. Newsboys challenges us to start a riot that is both good and valuable. What if we started a Love Riot in 2017? Some are more than glad to say good bye to 2016. For many, 2016 brought a hefty helping of pain, loss and grief. Live On Forever brings a message of encouragement and hope that nothing we have endured on this earth is permanent. Believers in Christ have hope that we will live on forever and that we cannot imagine how much more God has in store for us in the eternal. 2017 gets us that much closer to our eternal hope. Let’s celebrate this! As a parent, my children have access to all I have to offer like no one else has. As children of God, you and I have access to all our Father has to offer in a very complete and individual way. We have access to His love, power and strength that will carry us out of our old and into our new. Let’s celebrate being Children of God! There is so much symbolism in the reality of physically opening our hands. An open hand conveys an open heart. A heart that freely gives and freely receives. With an open hand, we make ourselves available to what God wants to offer us while also offering Him all that we have. Our Open Hands release all of 2016 and then we can receive all of 2017. The phrase “whatever you want” comes packaged like a weighty and unlabeled box of chocolates. Praying “Whatever You Want” into our new year can seem a bit scary but it is sure to be filled with goodness. Let’s begin this new year by surrendering our will and desires and receive whatever God has for us. The story behind this song is one of holding up a friend who is hurting. When there are no words or actions that would offer comfort, saying “I Will” with open arms inviting the wounded to sink in deeply may be all that is needed. Likewise, in moments when we don’t hear God’s voice we can trust that His arms are open wide and ready to comfort. As we move forward into 2017, maybe we could open our mouths less and open our arms more. A focus on giving simply can be profoundly generous. 2017 is moving in whether we’re ready or not. Are you going to choose to move in with it? Will you move out of the past and into the future? This song encourages us to get up out of our figurative or literal (whichever applies) chair and move. The clock is about to strike 12. In that very moment, let’s celebrate all the potential that 2017 has in store. 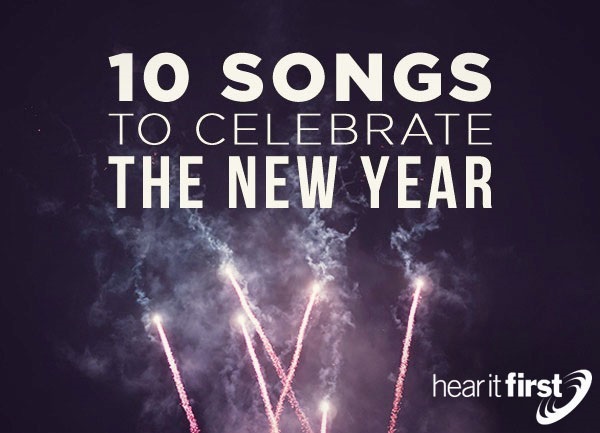 A common thread in these 10 Songs to Celebrate the New Year is the message of moving forward with hope which is definitely worthy of celebration. We don’t move forward to hope but with we move forward with hope because hope is already ours. Hope is already here. Grab a firm grip on to this new year and sing along, dance along and come along with me into 2017. May the Believers march boldly on into this new year celebrating with awe the goodness and greatness of God and the hope we have in being his children.